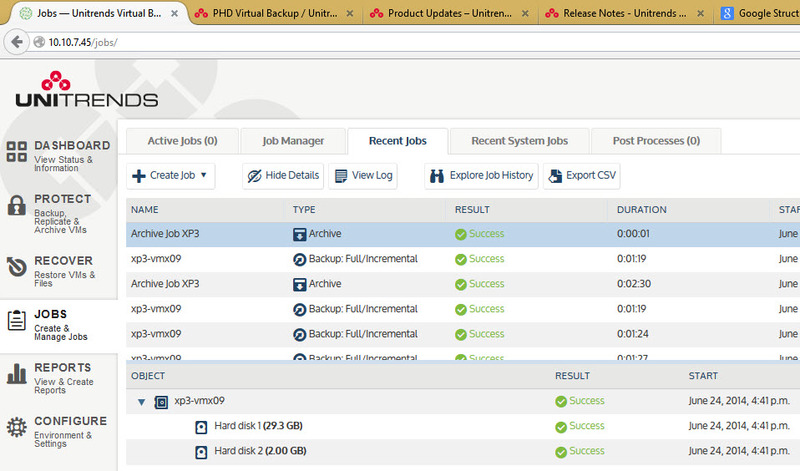 I recently tested a beta version of the Unitrends Virtual Backup v 8.0 (previously PHD Virtual) product. While I have reviewed PHD products in the past, I immediately noticed the major interface re-design on this new release. In fact, this virtual backup product now has over 120 new features and enhancements according to Unitrends with support for three major hypervisors from a single UI: vSphere, Hyper-V or XenServer. First, there is a new dashboard where the design and graphics are friendly, polished and gave me a relaxed feeling when browsing the controls, configuring and exploring the product. From the moment you first deploy the product, you feel its awesome speed. The UI is fast and responsive based on HTML 5, and you get a clear sense that underneath there is a very robust product. The new interface is so good, in fact, it actually pushes you to explore every possible option of the product. The architecture of Unitrends Virtual Backup has also changed. The distributed architecture allows you to deploy several appliances, each one with a different role, for large scale deployments. The first appliance you’re deploying in your environment is automatically inheriting the Presentation role which is the one that centralizes all the other appliances. Presentation (P) role – master view when managing several environments via single pane of glass. So during the deployment phase, you are walked through a visual assistant, which lets you choose your environment and which asks you if you’re deploying your first virtual appliance (VA) or if it’s second, third etc….. When you first start the product there is a quick overlay window showing different possibilities to get you started. For smaller environments you obviously choose the all-in-one solution, where Management and Engine and Presentation roles are present on the same virtual appliance. 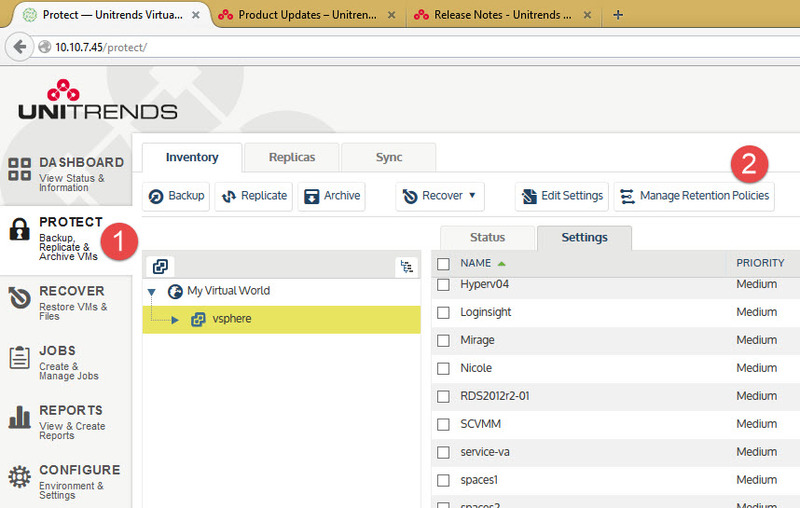 Unitrends Virtual Backup 8.0 gives you a multitude of options including NFS to store the backups. I think that every enterprise, the administrator has a requirement for backups to be stored on two different locations an (or) medias. Those backups should take the least space possible but also to be accessible fast with enough network throughput for fast recovery. Having a third copy of a backup in remote location is good option too but sometimes the remote location does not provide enough bandwidth for fast recovery of full VMs. Unitrends 8 provides several options when it comes to store backups and you need to configure at least one option to be able to start backing up your environment. Two ways are possible when setting up the product: simple, wizard based, or via advanced options. If you chose the easy way, the setup just needs 3 clicks. But you must make sure to attach new VMDK disk which will store your backups. This disk will get detected during the wizard based setup and allows the wizard to finish the easy configuration. If you want to use archiving or synchronization (great you have remote site and if you can place a host to remote site), you’ll need to configure archive location, sync location. You will also need to configure IR write space location, which is an Instant Recovery Write space. As you can see, you can add different types of locations with different types of storage protocol. The use case for remote replication of backups is interesting not only from the DR perspective, but also from redundancy perspective. In my small lab I was able to test the backup, recovery etc, but interesting feature was a feature where I was able to configure a sync between two appliances. This allows to synchronize all the stored data from one appliance to the other one. You can see this example of configuration on the image below. The attached synced storage which lays at remote office has the same data as the backup storage. It’s because once you start backing up your virtual infrastructure, the backup data store are automatically replicated behind the scenes to the sync storage destination. The example shows 3 backup appliances, each one of those attached to different ESXi host. The top one is for archiving, middle one for syncing and the bottom one for storing the actual backups. But as I mentioned earlier, this additional storage spaces (sync, archiving, IR space) are optional but very useful. If you not using sync features you obviously no need to setup sync location. Here is a list of available options which you can configure as a storage target for each of the functions, where attached disks provide the best performance. As you can see, you can “hook” pretty much everything. 1. 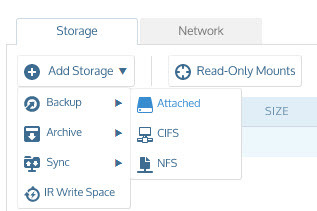 Attached Disk via SAN/iSCSI/NFS – if Unitrends appliance runs on bloc storage then simply adding another disk to the appliance creates a necessary space to store your backups with fastest performance. (The recommended setup for best performance according to Unitrends). 2. NFS – Can be remotely attached NAS or Linux server, via NFS. 3. CIFS – use Windows share, or some dedicated NAS hardware on remote server to store backups. Once configuration is finished along with assigning a license to your environment, you can start to backup your VMs. But one of the first thing to do after deployment is to setup the Timezone for your location otherwise the backup schedule won’t be right. You can do it by going to the Admin menu > Account > Edit. While I haven’t been able to test performance as my lab environment isn’t based on enterprise hardware, according to Unitrends, the product has 50-250% better backup performance with improved concurrent processing and scalability across multiple vCPUs. Virtual environments have many choices for backing up data, with various SLA, different RTO and RPO requirements. UVB enables you to use fewer jobs to backup your whole infrastructure since multiple virtual backup appliances (VBA) work together and distribute the work load between each other. It’s even possible to consider using a single job to backup your entire infrastructure. Per VM retention – See the backup job options on the screenshot below. Note the Application aware credentials allow you to use VSS to protect workloads with Exchange or SQL. 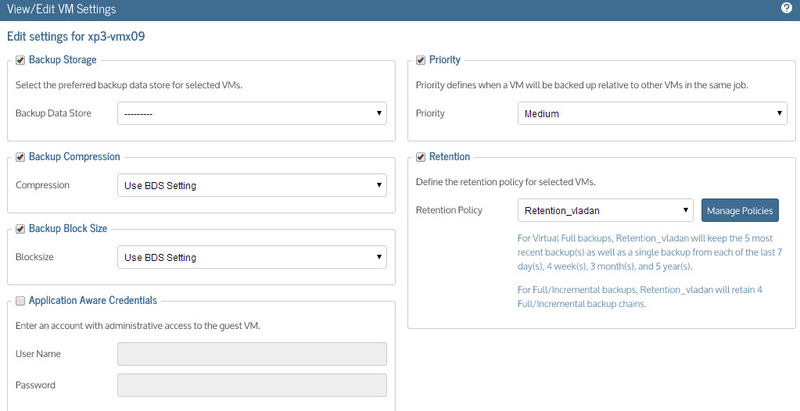 Each VM can have a different retention policy if needed or can be executed with different priorities. The retention policies can be defined through the UI by going to the Protect tab on the left > Manage Retention Policies. 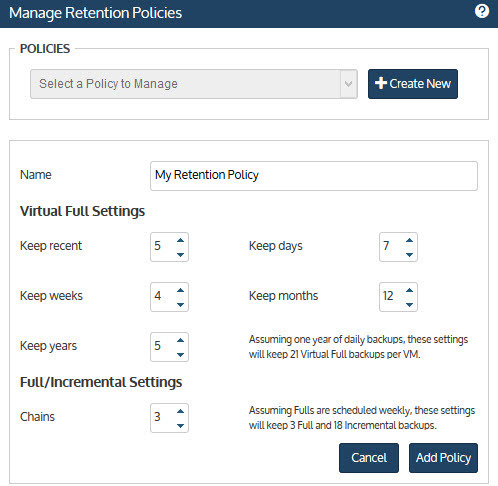 By clicking the button it opens another window where you have the possibility to create a new or adjust existing retention policy. Critical VMs first – There is an option to mark certain VMs within a particular job as critical, which acts to prioritize and process those VMs first. 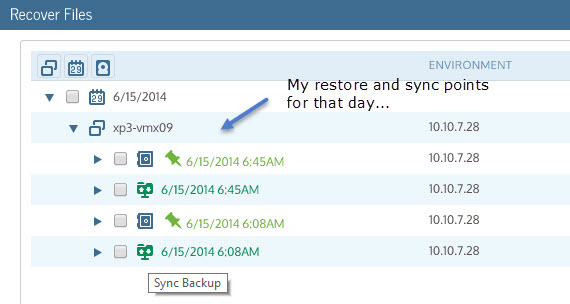 VM replication and archiving trigger directly at the end of backup jobs to avoid scheduling overlaps. You can set VM priorities to ensure that important VMs are protected first. The new Archiving function, when configured, allows to trigger archiving job directly after the backup job. As the archive job kicks in after the backup job, there is no “pressure” on the production environment VM during the archive job. It’s actually a copy job (with deduplication and compression). The archive function needs at least one backup to be done first. Then you can go to the protect tab to select the archive option. Archiving of individual VMs is useful for offsite backups. Archiving is now up to 8X faster depending on your bandwidth. All with a tiny memory footprint and the best deduplication in the VM backup market with 96% efficiency over time. The UVB deduplication is even more sophisticated with adjustable block sizes per VM for added efficiency, especially good for moving data across the WAN. After my first backup I was testing the file level restore feature as I assumed that full restore just works. In my experience it’s FLR (file level restore) that might be “tricky” to work with. But even without a manual I quickly discovered how easy it works. Note that the restore points are not only provided from the default backup repository, but also from the sync backup repository. Once you pick the restore point you want and leave the other options as default, validate by clicking the Create button. You’ll return back to this interface from where you’ll be able to click the show details button. This opens a small window where you’re asked for credentials to access those resources. I prefer to use my Windows domain administrator account as the CIFS method is the default selected method. You can see your backup and recovery health at a glance, including performance trends or risk across multiple virtual environments and across all three major hypervisors (VMware, Hyper-V, Xen). With one-click you can go one level deeper and see details on what exactly is protected, unprotected, or having problems. I haven’t tested Hyper-V backup as I don’t run Hyper-V in my lab, but according to Unitrends, a new proprietary CBT is used which allows the backups to execute 50X faster. Another interesting feature is that recovery and VM replication allow you to select resource pools, clusters, distributed virtual switches, and other target objects to keep you from having to manually do anything after recovery. You can also quickly recover files from Linux VMs with LVM disks. Automatic Updates – It’s possible to setup automatic updates on the Presentation VBA which allows the updates to be installed to all VBAs of the whole environment. Live KB articles – The product has links which point directly to the internal KB articles at PHD support, so if there is a change on a KB article, the end user has the latest version available. Support tickets – You can easily create support tickets and upload logs from within the UI. I must say that I was pleasantly surprised and impressed with the product’s overall speed and responsiveness when using the UI, executing backups or configurations. 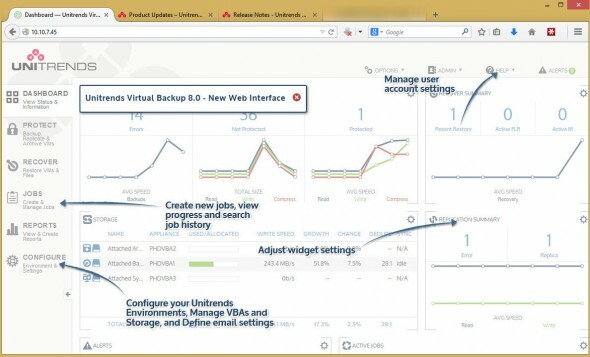 And I want to emphasize that Unitrends Virtual Backup 8.0 changes everything—because it provides a perfect example of what a user interface should look like and how it should perform. The buttons are intuitively placed where you would usually look for them and the overall learning curve is very fast. While there was no documentation when I tested the product, I didn’t really need it for performing any of the major functions or configuring any of the options. Overall the product delivered outstanding performance through very fast UI with functions that today’s admins needs and use. Backup/replication products todays innovate in providing more features for the end user as more and more data needs to be protected within a small backup window. I could easily deploy and configure three virtual appliances, each one of those with different kinds of storage (backup, replication, and archive) using only a few clicks. The single pane of glass UI allowed me to manage all three appliances instantly and spin up an additional appliance is a matter of minutes. The distributed architecture allows for multiple VBA engines to work on a single job and UVB 8.0 optimizes the job for you by picking the best options. You can even backup job settings and configuration in the product. In case something goes wrong, I can redeploy the appliance and restore my settings because all job and report info resides on a second small data disk that can be attached to a new VBA so I can retrieve key info if a VBA fails. The VMware version I’ve been testing does not need Windows licensing as its packaged as Linux virtual appliance. Bottom line? Unitrends Virtual Backup 8.0 is the ideal product for critical backup, replication and archiving functions required in every virtual environment today. Note: Please note that this review was sponsored by Unitrends (PHD).